The calendar sheet for October is all about Alpine festivities, harvest festivals and fairgrounds. The best known and biggest annual fair of al is the so called "Oktoberfest", the October party in Munich. As you can see in our calendar sheets, only a small bit of the whole event takes place in October, the Oktoberfest already starts mid of September. But enough subtlety, there are plenty of possibilities to find some heart-shaped ginger bread in October. These "Lebkuchenherzen" were supposed to be bought by a young chap to give it to a young lady, with messages like "Be mine" - "You are the best" and of course sweet nick names like "Darling" - "Spatzl" or even "Little Witch". Nowadays one can give these hearts as a give to the one you like, your wonderful daughter, to your father or even to yourself. 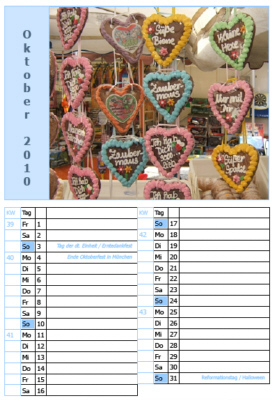 The calendar sheet for October has a picture of Gingerbread-Hearts and all weekdays, the number of the calendar week and enough space to fill in your own important dates, birthdays and other things to remember. With this one sheet calendar you have everything at sight from the 1st to the 31st of October.